This is the seventh in this series of 26 posts, one for each letter of the alphabet, that I am writing during the Blogging from A to Z Challenge, April 2016. You can find all the posts, as they are published throughout the month, by following the A-to-Z April 2016 tag. Grounded. We toss the word around a lot. We say someone is really grounded, or that spending time in nature helps us feel grounded. But what is it, really? The dictionary will tell you it means emotionally stable, down-to-earth. That’s not a bad place to start. One way to think about it is in terms of contrast. In my experience, the opposite of grounded is “in one’s head.” Flighty, scatterbrained, separate. Thinking about what’s going on with us instead of experiencing it. Head in the clouds, as opposed to feet on the ground. 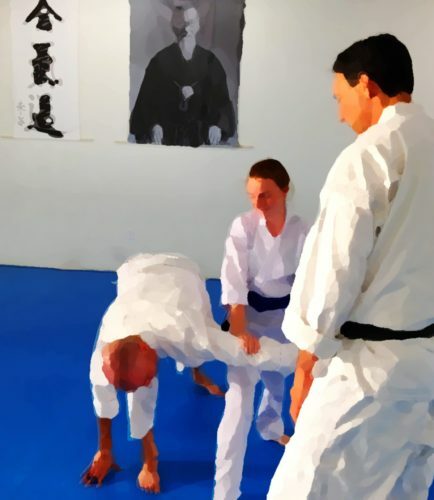 Being grounded is a principle we embody in our Aikido training. We recently explored this in a workshop at the dojo. Some of the experiments that Sensei led us through demonstrated how we can be more powerful and stable, with less effort, when we are grounded. A basic exercise was physically easier when we simply brought our attention from our forehead to our lower belly – getting out of our head, and into our gut, moving from our center. This is only one example of what grounding can do for us, and grounding is only one of the many embodied principles we focus on in Aikido. We train to be relaxed, confident, and direct, balanced, centered, and receptive, and we do so not by thinking about these as concepts, but through regularly training in their physical expressions. We build them into our bodies as qualities we naturally possess. We’ve been rushing around, putting out fires and crashing toward deadlines all day. We find that we are chattering away in our minds, flitting from one worry to the next. We are wound up and uneasy. We can’t do our best work, or be present in the moment, in this state. We need to settle down. Breathe steadily and naturally, without forcing or holding your breath. Let your jaw and tongue be loose and soft. Let your knees bend slightly, just so they are not locked. Let your shoulders hang from your body without tension. Visualize sand pouring down through your body, as it would in an hourglass. Feel your feet connecting with the ground. See if you find yourself feeling quieter and more relaxed now. You will likely be able to respond calmly and fluidly from this state. You may even find that those around you start to seem more settled, too. Practice this regularly, and you may find yourself more often and more naturally settling into a powerfully calm, grounded way of being. Want to learn more about embodied practice?